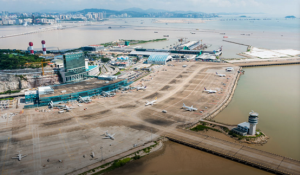 Macau and Zhuhai airports could play an essential role in a possible Greater Bay Area joint airspace, although the expansion of the MSAR airport to increase its aviation capacity has been slow, members of the business aviation industry have told Business Daily. According to Charlie Mularski, Chairman of the Asian Business Aviation Association (AsBAA), both Macau and Zhuhai, with their proximity to Hong Kong, can benefit from taking the business aviation operations currently at a crunch and congested in Hong Kong with the progressive exposure to business aviation creating potential economic boosts for both cities. “Recently, we’ve seen how the Greater Bay Area is an area with a comprehensive infrastructure development plan that will leverage all cities in the Greater Bay Area. Macau and Zhuhai play a key role in this area, especially when it comes to aviation connectivity,” the AsBAA chairman told Business Daily. The Chinese Government’s Greater Bay Area development plans to create a dynamic air space connecting the five main existing airports in the area: Hong Kong, Macau, Guangzhou, Shenzhen and Zhuhai, connecting an area in which more than 66 million people reside. In terms of passengers, in 2016 Hong Kong International Airport registered 70.5 million passengers while the Guangzhou airport welcomed 59.7 million, Shenzhen handled almost 42 million, Macau International Airport saw 6.6 million, and the Zhuhai airport recorded 6.1 million. Meanwhile, several expansion projects for the existing airports are underway, with Hong Kong International Airport’s third runaway slated for completion by 2023. Guangzhou’s Baiyun International Airport plans to add a fourth and fifth runway by 2025, while Shenzhen’s Bao’an International Airport is considering a third runway. There are also plans to develop a regional RMB35 billion (US$5.1 billion) Pearl River Delta airport, expected to handle 30 million passengers a year, according to South China Morning Post newspaper. According to Mr. Mularski, Hong Kong International Airport’s new runway is still a long way from completion although once finished demand will quickly increase, with major airlines, low cost carriers, and cargo freighters forecast to grow significantly in the next 10 to 20 years. 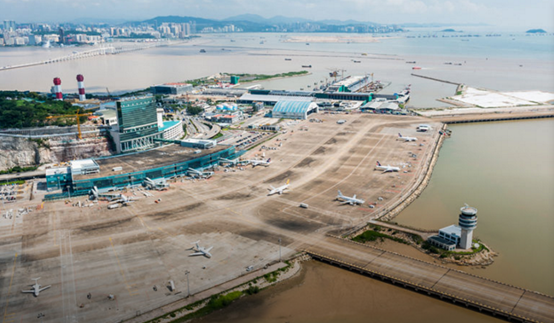 Consequently, Macau and Zhuhai airports could play a role in ‘absorbing and supporting’ business aviation slots with enough parking and flexibility. The aviation expert believes these could be achieved without much infrastructure development, the solution lying in an easier permit process and more efficient utilisation of the existing ramp/parking space. “Attracting business aviation will lead to economic development in both Macau and Zhuhai; we know that business aviation hubs lead to investment, growth, job creation and overall economic development. With this in mind, we’ll see Macau and Zhuhai advance and become recognised as viable alternatives to Hong Kong for businesses looking to set up / expand in the region,” he stated. In terms of business aviation, business jet movements – including private flights – at Macau International Airport numbered 2,656 in 2016, with 11,600 helicopter movements between the city and Hong Kong and Shenzhen, the MSAR Civil Aviation Authority (AACM) told Business Daily. When asked about works to co-ordinate the MSAR’s offerings with the remaining Greater Bay Area air spaces, AACM said the aeronautical authorities of Mainland China, Hong Kong and Macau have set up a regular meeting mechanism with the aim of studying the enhancement of co-ordination for air traffic management in the Pearl River Delta Region. ‘A supervisory working group and a technical working group were established for such purpose. The three parties have since then held a number of meetings to discuss the present operations in the region and have agreed to do future planning based on the principle of joint development in the region,’ read the response to Business Daily. When asked about the current situation of the aviation sector in the Greater Bay Area, Mike Walsh – CEO of Asia Jet Charter, a business aviation company and part of the HNA Group – told Business Daily that the situation might hav reached a “bottleneck”. “There’s a mixing of scheduled with non-scheduled flights all the time. The scheduled size keeps growing; the low cost carrier segment is growing with visitation growing, too,” he stated. However, the Asia Jet CEO believes there is “enough existing capacity and infrastructure” if the cities in the region co-operate and work to do more with their existing resources to “everyone’s benefit”. At the beginning of the year the Macau Government stated it wanted to expand Macau International Airport’s capacity to accommodate up to 15 million passengers, 58,000 tons of freight and 107,000 aircraft movements per year. The expansion is intended to better integrate the airport into the Greater Bay Area, with an expected increase in the number of aircraft slots to 47, of which 20 would be equipped with loading bridges. Previously, CAM-Macau International Airport Company Ltd. told Business Daily it had started expanding the North passenger terminal in order to increase its total area from 45,000 square metres to 59,000 square metres by mid-2017. However, CAM is still working to complete a business jet hangar, with the plan for the expansion having been completed in the fourth quarter of 2015 and with Swiss airline company Jet Aviation winning a 10-year concession to operate the new maintenance, repair and operations (MRO) facilities. Initially scheduled to open in the second quarter of 2016, the new hangar, as at the time of writing, had yet to open, with AACM telling Business Daily that it is still undergoing a ‘process of inspection of fire fighting facilities’. The contract requires that the company lease half of the new 8,000 square metre hangar in addition to 1,000 square metres of workshop and office space. The new facility is expected to help alleviate congestion at other airports in the region by providing maintenance, aircraft cleaning and parking services for business jets. According to AACM, it was up to the Fire Services Bureau to decide when the hangar could start operations, with the fire inspections appearing to have been ongoing between April and June. In statements to Business Daily, the AACM Director of Airport Infrastructure & Air Navigation said he believed the new hangar would be finished by the end of June or July. Business Daily contacted the Maintenance Manager of Jet Aviation Macau, who said the group was not able to provide any new information on the opening of the new hangar at this time. According to a local airline pilot who chose to remain anonymous, while the airports of Hong Kong and Zhuhai have expanded rapidly Macau has “stagnated” with the new MRO facility delayed for almost 10 months. With Hong Kong’s fourth runway development still set to take some time, Zhuhai Airport appears to have stepped up towards functioning as an extra Hong Kong Airport runway, with the Hong Kong’s Airport Authority having a 55 per cent share and a long-term management contract to run the Chinese airport. According to statements made to the South China Morning Post, Albert Yau, the General Manager of Zhuhai Airport said there were plans to “divert freighter aircraft, business jets and some international cargo handling to Zhuhai to free up space for more commercial passenger flights in Hong Kong”. The airport was still planning to develop a 260,000 square metre air cargo logistics park over the next two years, mainly to handle international cargo going to, and coming from, Hong Kong. “The links between Zhuhai and Hong Kong are becoming more and more efficient, with shorter connection times and more viable options in the form of helicopter flights and, of course, the Hong Kong-Zhuhai-Macau Bridge,” Mr. Mularski told Business Daily. In November 2016, the AsBAA chairman flew a commemorative helicopter flight to Zhuhai from Hong Kong, with helicopter company Sky Shuttle operating the first civilian charter flight from Shun Tak Heliport to Zhuhai Jin Wan Airport. The flight followed a deal to conduct trial periods to make Customs, Immigration and Quarantine (CIQ) services available at Zhuhai Airport, with AsBAA in negotiation to reduce the period it took to get a flying permit between the two cities from seven and 10 days. “Despite a lot of challenges we’re quite proud to have had that done, and now there’s an approved routing for low altitude flights between Hong Kong and Zhuhai,” the CEO of Asia Jet told Business Daily. For Mr. Mularksi helicopter flights can reduce the journey time from Hong Kong to Zhuhai Airport from at least three hours to “about the same time it takes to drive from Central to Hong Kong International Airport”. “This makes Zhuhai a viable alternative as a destination and departure point for the 130 business jets currently based at HKIA,” he added. Meanwhile, the new Taipa Ferry Terminal was inaugurated last month with five helicopter pads, although the MSAR Government says it has not yet initiated a public tender for their use. When asked if it was planning to apply to operate from the new helipads or increase helicopter flights, Sky Shuttle Helicopters Limited – the only company operating helicopter flights based in Macau – only said that when a public tender is opened “it would carefully review and consider” its position. According to a local pilot, Macau International Airport is closer to Hong Kong than Zhuhai and has plenty of space for “more parking and hangars” but “little progress is being made” in expanding capacity. “Long term plans have now been published for the development of Macau airport. However, these plans only surfaced when Hong Kong and Zhuhai airports were rumoured to be teaming up to request the closure of Macau airport. To me, the response from the Macau authorities looks suspicious, and suggests genuine concern about the sustainability of our airport,” the pilot told Business Daily. According to the local airline pilot, with Zhuhai controlling low level airspace and Hong Kong controlling all airspace to the East and South, Macau is only in control of a small air space within a few miles of the airport, and limited to up to 3,000 feet (910 metres). “Although low level airspace is cramped, and getting tighter, I don’t see how the status quo will change in the near term,” he added. For the pilot, the best option of future business plans for Macau International Airport could be to become a ‘low cost’ hub, or a ‘business aviation’ hub to complement Hong Kong. “Critical mass would certainly help Macau retain its airport, and prevent the land turning into another expensive housing development […] The truth is that no-one knows how this saga will end. One thing is certain: the bridge to Hong Kong will bring Macau to within 30 minutes of Hong Kong’s airport by road,” the pilot remarked. With a bridge, why fly? According to the AsBAA chairman, the expected opening of the new Hong Kong-Zhuhai-Macau Bridge at the end of the year would not make flying redundant but allow a larger “synergy of air, road, rail and rotor” that would allow the “un-bottling of any bottlenecks”. “Easier and flexible permits for business jets to land, combined with an efficient bridge connection and/or helicopter for faster transfers will immediately increase revenues for the airports and cities,” he added. For the AsBAA chairman, the biggest challenge in increasing co-operation between the Greater Bay Area airports is overcoming different regional regulations. “We have many different countries in close proximity in the APAC (Asia-Pacific) region, which means dealing with several different governments and their regulations. Naturally, this will pose some difficulties in the way of differing policies, procedures, and timelines,” he said. However, the challenge would not be “impossible” with a common platform for aviation rules and regulations, allowing Macau, Hong Kong and Guangdong Province to operate with mutually agreed processes and regulations, permitting the leverage of all existing and future infrastructure. “A great example of this is how the greater New York area operates with the Port Authority regulating and managing over 10 airports in the zone which cover multiple counties and cities. It can be done, and the economic gain is very high,” Mr. Mularski concluded.